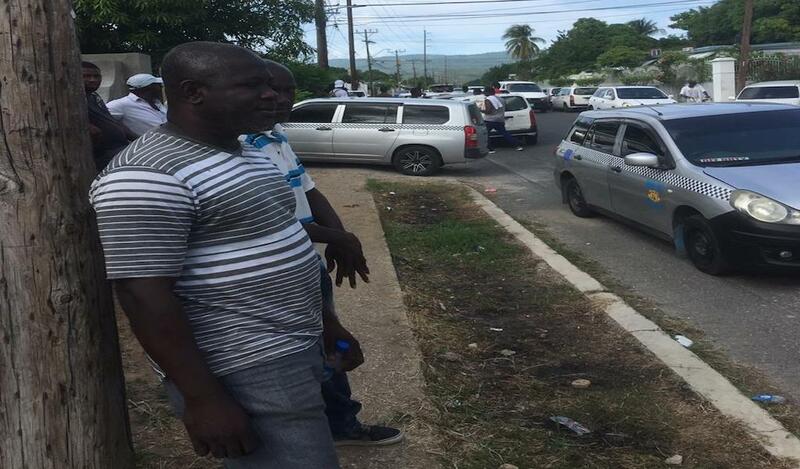 A cop trying to restore order in Stewart Town, St Mary amid protesting taxi operators. Recently, taxi drivers in Jamaica launched a protest against new traffic legislation implemented by the government. The drivers are upset with aspects of the legislation which they claim will affect their livelihood and have branded it economic slavery. The law they take umbrage to deals with the responsibility of the owner of a vehicle for the actions of the individual who is driving it in the event of a breach of the Road Traffic Act. The law was tabled in the House of Representatives by Transport Minister, Bobby Montague, and stipulates that tickets and fines will be levied against the owner of public passenger vehicles as if the owner was driving the vehicle when the breach was committed. The taxi operators blocked a section of the Sir Florizel Glasspole Boulevard, briefly preventing motorists from accessing the Norman Manley International Airport and the eastern section of the island via St Thomas, in a bid to air their grouse. Those roadblocks were promptly dismantled by the police. Dissatisfied with an unfavourable response to their concerns, the taxi operators of the Kingston Metroplition Region continued their protest at Mandela Park in Half Way Tree and along Sutton Street in downtown Kingston. The protest lasted several days. It seems to have got them nowhere. As a matter of fact, most motorists and other members of the commuting public were relieved when the taxi men withdrew their services. Social media platforms were abuzz with excitement and relief that the drivers had taken to protest and had given other users a welcome relief from their usual reckless, uncaring and boorish use of the roads. The motoring public has no sympathy for the taxi and minibus drivers, and who can blame them? The same day they decided to voice their displeasure with the law, news broke that two taxi drivers were arrested after both had a total of about 1,400 unpaid traffic tickets between them. I know quite a few persons who drive route taxis, and also for established metered cab companies. Most of them are decent citizens who are seeking only to feed their families, however, when they take to the road, especially the route taxi drivers, the robe of decency is replaced by a mentality not even fit for swine. These road hogs bore, swivel through traffic, create a line of traffic for themselves and stop just about anywhere they choose. Not to mention the breakneck speed at which they drive. A ride from Half Way Tree to Mannings Hill Road in one of the route taxis is not for the faint of heart. I know, I have been there and done that; as the elders say, your heart is in your mouth. On a recent trip to Jamaica, I drove a rented vehicle along Red Hills Road to attend to a business matter. 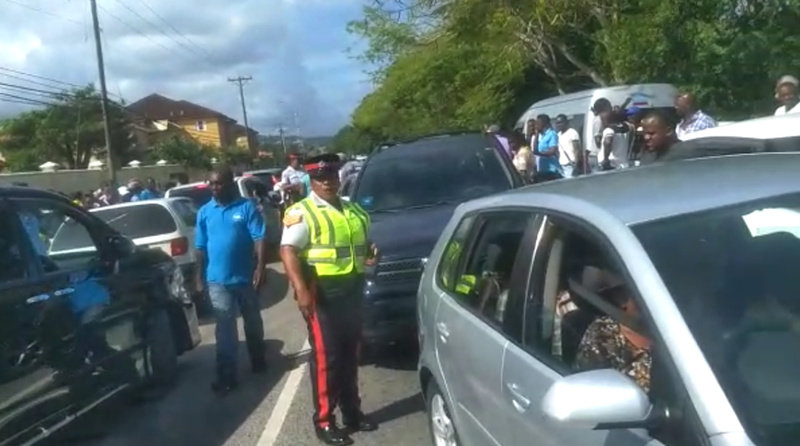 Upon reaching the vicinity of the Sugar and Spice bakery, close to the entrance of Red Hills Road, cars were backed up on both sides of the thoroughfare. Lo and behold, two of the route taxi drivers, totally unconcerned that there were other users of the road who wanted to go about their business, stopped on opposite sides of the road and were engaged in lively conversation. One incensed motorist was at his wits end and shouted to the driver of one of the cars. His remark was greeted with a disdainful answer by the taxi driver who was blocking his path. “You nuh see me and me friend a talk P….y?” he said. Route taxi drivers have been known to be involved in fatal accidents and those which have caused serious damage to property and, instead of facing up to the consequences, they flee the scene of the accident leaving their victims to suffer horrible fates or a tantamount repair bill. 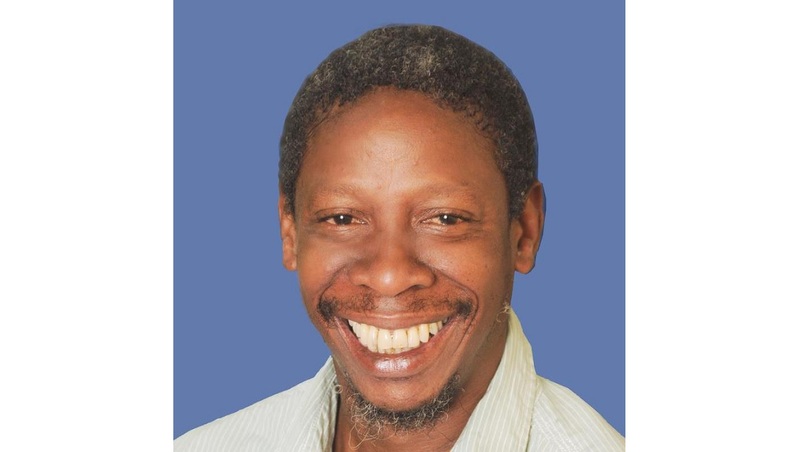 The callous behavior of the taxi drivers, especially the route taxi drivers along with minibus men, is the reason why the public has no sympathy for their cries and openly express their support for the government’s move. For some, it has been too long in coming. Many have openly expressed their glee because commuting during the protest has been less hazardous and they have had less occasion to display their knowledge of Jamaican curse words, which seem to be par for the course when driving in Jamaica. The protest was led by the Jamaica Association of Taxi Owners and Operators (JATOO) who has for years advocated on behalf of their members. It is very interesting to note that, for all those years, never once has JATOO called upon its members to practice safer driving habits in pursuit of the almighty dollar that they claim feed their families. JATOO must now be honest with themselves and admit that many route taxi drivers have no regard for other users of the road and must reign in their members or face the backlash. For too long they have been the face of the indiscipline and bad manners that has transformed Jamaica in to the country of low morals and values that it has evolved into. In short, you called it upon yourselves and nobody is in support of you. Drive better on the roads and respect other users. Everybody has bills to pay, but do cabbies care?